Vegetarian Cats & Dogs, written by the nationally recognized authority on meatless diets for cats and dogs, James Peden, tells a fascinating story. Starting with the amazing story of Little Tyke (a vegetarian lioness), it follows modern day “Little Tykes” as new age felines and canines live happily and healthily without meat. The book covers the fundamentals of plant-based feeding, specific ingredients, specific health issues, and more. Please understand the recipes in Vegetarian Cats & Dogs are out-of-date after our 2017 formula updates and following the 2016 AAFCO nutrient requirement updates. Please refer to kibble and wet food recipes on our website (VIEW HERE) and in the recipe brochures that ship with the Vegepet supplements for the most up-to-date recipes. 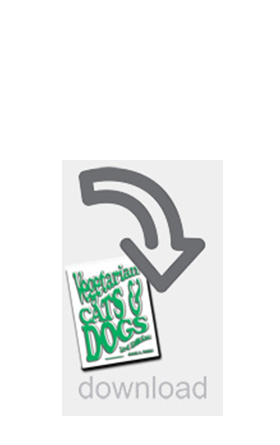 Download this pdf file and you’ll have the full copy of Vegetarian Cats & Dogs (3rd edition) by James Peden. You can download the book from the order confirmation page after payment or from the follow up email you receive.